1870s autograph album of Ida May Gray, before and after her marriage to Alexander Dunn. 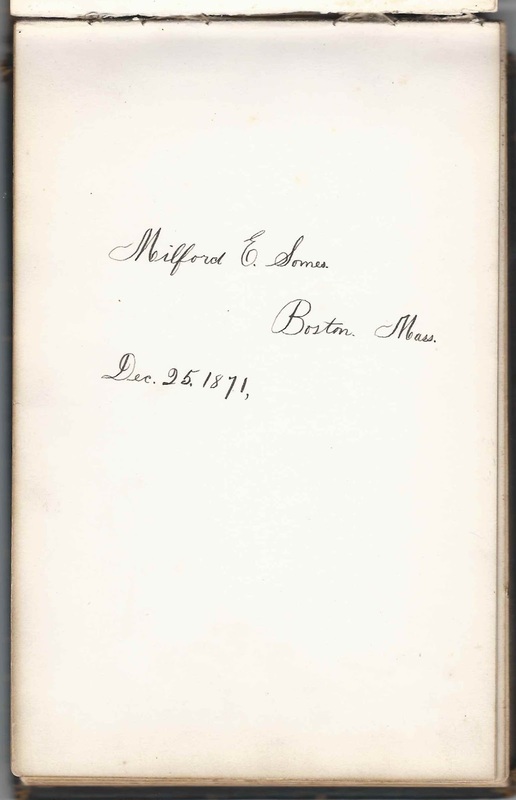 Incidentally, the album was purchased with another album from the Boston, Massachusetts, area that belonged to a "Ria" and featured pages signed by Ida's younger brother Edgar Elmer Gray and younger half-brother Milford Ernest Somes. One of Ria's parents was presumably the son or daughter of Jesse and Mary Salmon of New York and Boston, as Maria J. Salmon of Charlestown, Massachusetts, called Ria her niece. I haven't yet teased out the connection between the two albums; hopefully a reader can solve the mystery. Ida's album may have been a Christmas or New Year present; the first page was inscribed by her brother William Ellery Gray in January 1876. 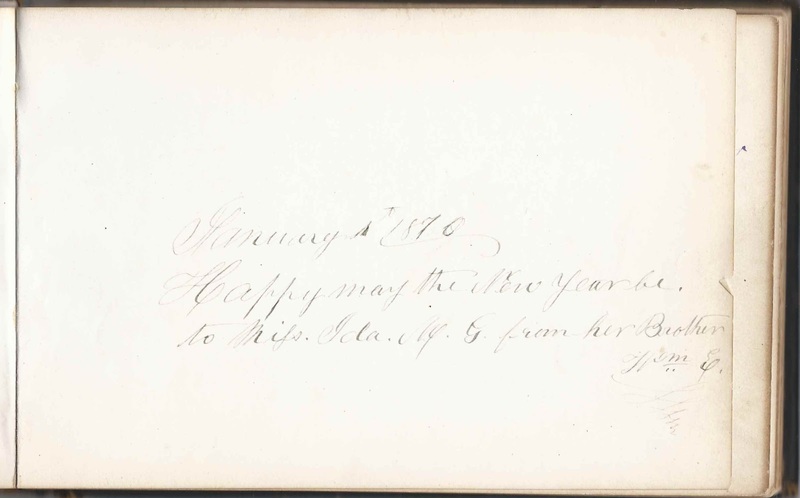 His future wife Anna E. Newmarch also signed a page. 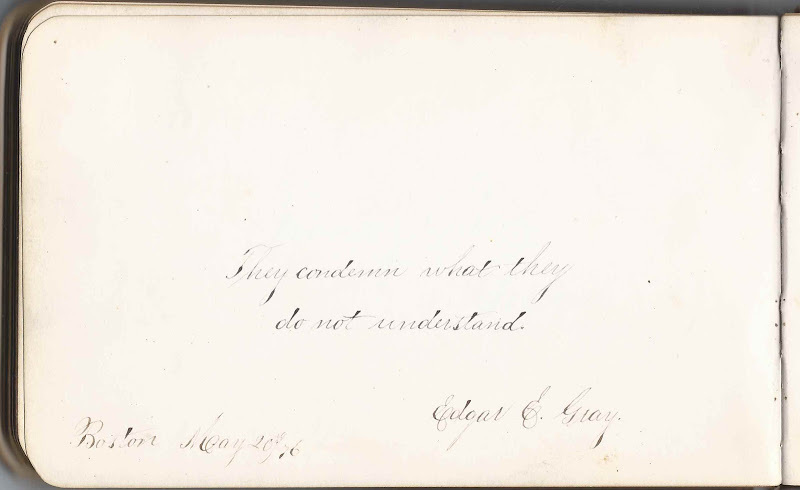 The album is approximately 8" x 5-1/4" and contains the sentiments of 26 of Ida's relatives and friends. An alphabetical list of the signers appears at the end of this post. Ida May Gray was born 4 February 1851 at Edgecomb, Maine, the daughter of Charles Ashley Gray and Hepzibah R. (Huff), who were born at New York, New York, and Edgecomb, Maine, respectively. You can see photographs of Charles Ashley Gray and Hepzibah R. (Huff) Gray here. Ida's paternal grandparents were James and Sarah Amelia (Ashley) Gray. Her maternal grandparents were John and Charlotte (Billings) Huff. Both of Ida's parents had children from other marriages, so Ida had older and younger half-siblings, as well as four full siblings. Charles A. 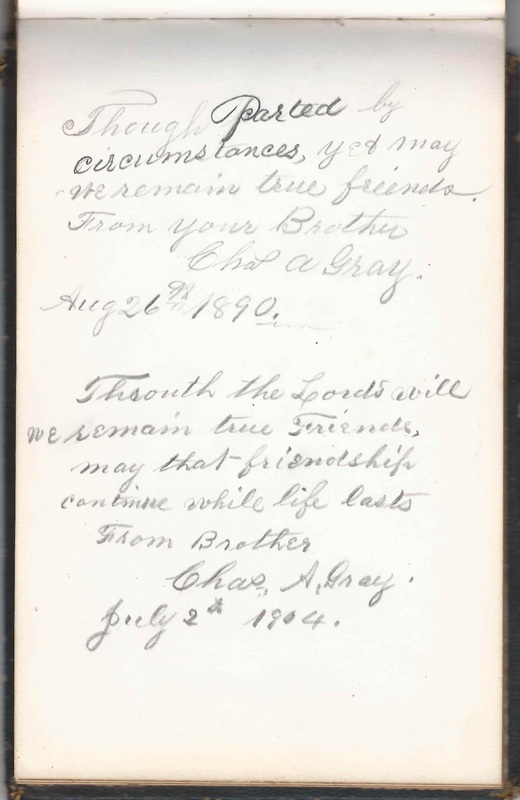 Gray, Ida's older half brother, from her father's first marriage to Sophia (Hersey), signed a page twice, once on August 26, 1890, and again on July 2, 1904, the last date of an autograph in the album. After Ida's father Charles Ashley Gray died, her mother Hepzibah R. (Huff) Gray married Joel Somes, son of David and Abigail (Trask) Somes. Joel Somes was born 1 August 1805 at Edgecomb, Maine. Hepzibah and Joel had two children, Julia E. Somes and Milford Ernest Somes. 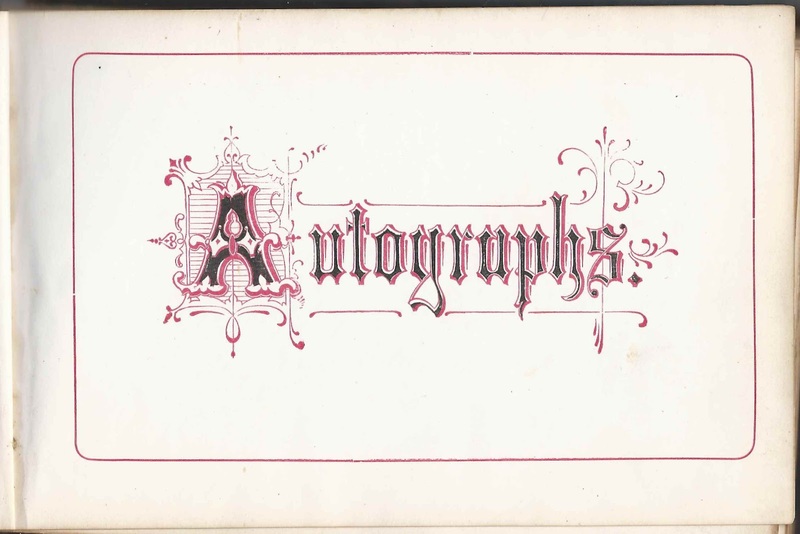 Julia signed a page in Ida's album on June 15, 1873; she died 24 September 1884 at Boston, Massachusetts. 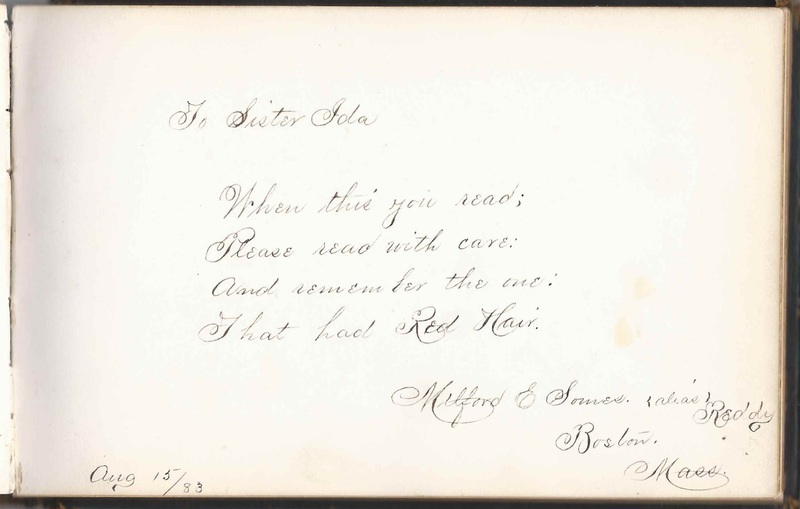 Milford Ernest Somes, "alias Reddy", inscribed two pages in the album, first on December 25, 1871, and again on August 15, 1883. 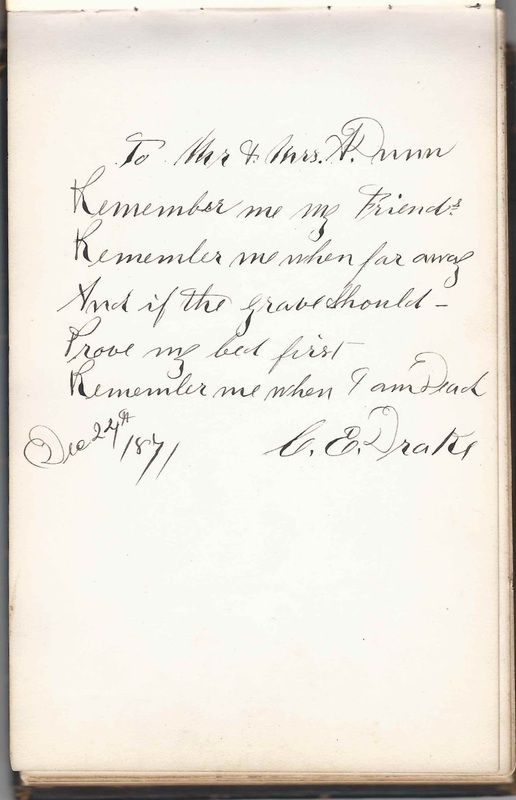 Ida's sister, Alice Eva (Gray) Drake signed a page as A. E. D. on December 25, 1871. The C. E. Drake who signed a day earlier on December 24, 1871, was likely Alice Eva's husband, Charles E. Drake. 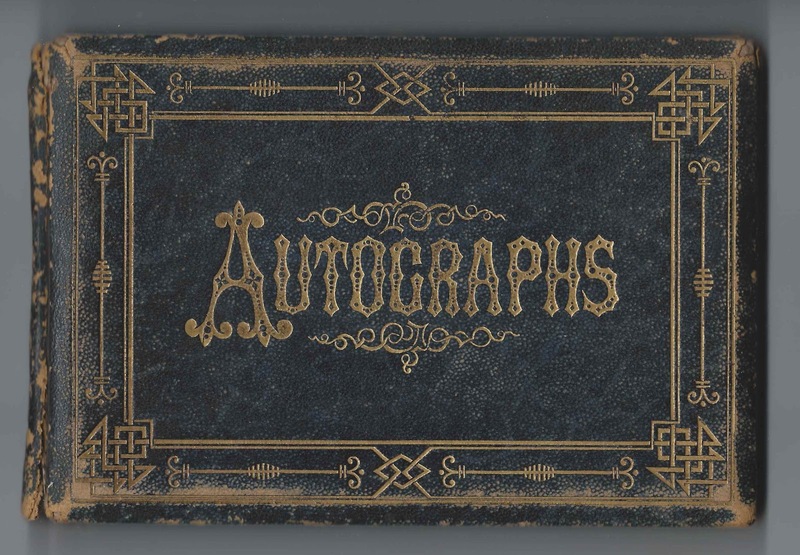 Ida's brother Edgar Elmer Gray didn't sign a page in this album, but he did sign one in the companion album mentioned above, at Boston, Massachusetts, on May 20, 1876. On 14 September 1870 at Boston, Massachusetts, Ida May Gray married Scottish immigrant Alexander Dunn, who was born May 16, 1846, son of Alexander Dunn and his first wife, Elizabeth (Paul) Dunn, and was one of four siblings born in Scotland. Elizabeth (Paul) Dunn died in 1856, and it looks as though the remaining family members then left for the United States. 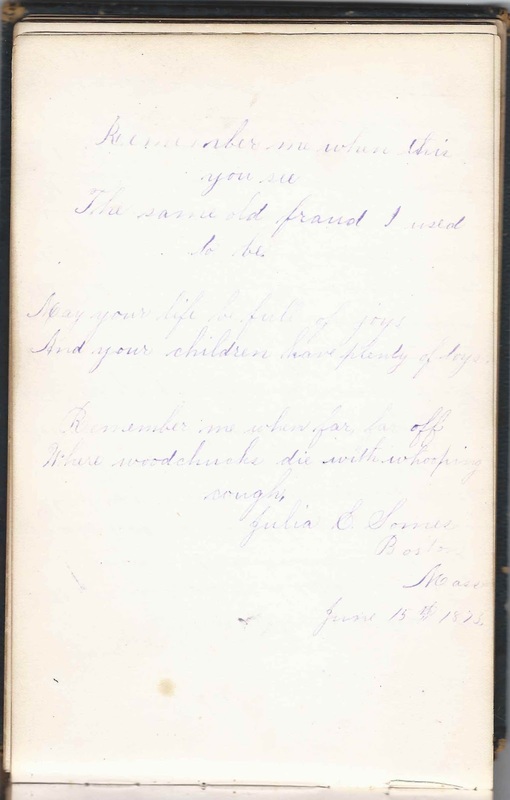 Young Alexander's father Alexander married Mary Mitchell White at Hingham, Massachusetts, on August 6, 1861 and had three more children, one of whom, Mary E. Dunn, signed a page at South Hingham, Massachusetts, on July 23, 1876. Alexander, a machinist, died in 1917; Ida died in 1934. If you have corrections and/or additions to the information above, or information on any of the signers listed below, please leave a comment or contact me directly. One interesting page contained a sketch presumably done by signer Hattie Clifford at Christmas in 1871. 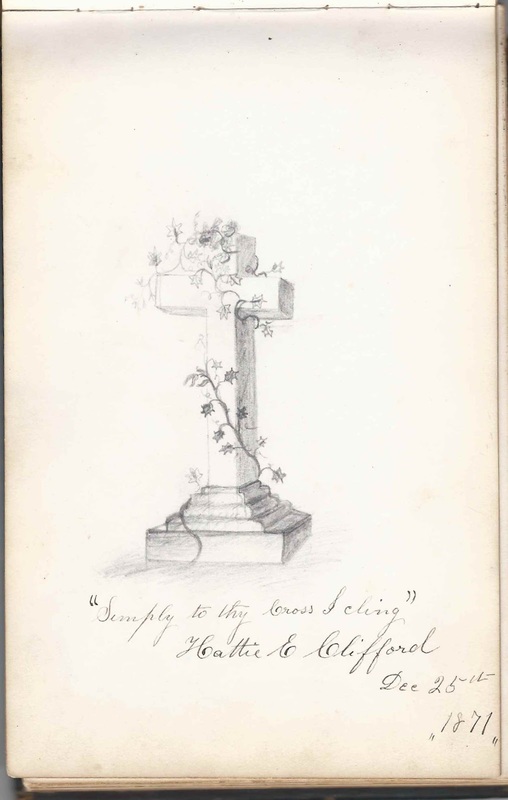 Hattie E. Clifford, signed on December 25, 1871; she sketched a cross on a pedestal, with ivy entwined around it. 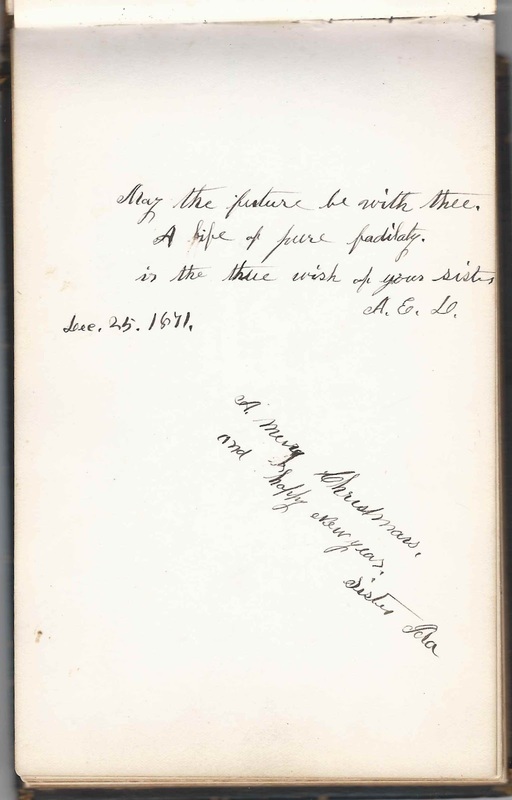 A. E. D., signed on December 25, 1871; "your sister". She was Ida's sister Alice Eva Gray, who married Charles E. Drake. Gertrude E. Drake, signed at Boston, Massachusetts, on August 18, 1883. She was the daughter of Henry Stephen Drake and his wife Clara. Henry was as brother to Charles E. Drake, husband of Ida's sister Alice Eva (Gray) Drake. Carrie J. Drake of Boston, Massachusetts, signed on August 19, 1883. Sister of Henry Stephen Drake and Charles E. Drake, who was the husband of Ida M. (Gray) Dunn's sister Alice Eva (Gray) Drake. Mary E. Dunn of South Hingham, Massachusetts, signed on July 23, 1876. Presumably Mary Elizabeth Dunn, half sister of Ida May (Gray) Dunn's husband Alexander Dunn. William E., signed in January 1870. He was William E. Gray, brother of album owner Ida May Gray, who married Alexander Dunn later that year on 14 September 1870. 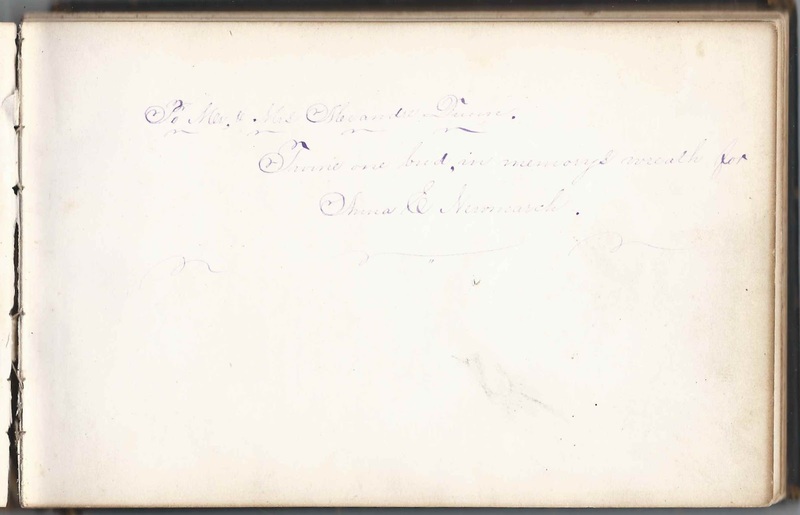 William's future wife, Anna E. Newmarch, also signed a page in the album. Charles A. Gray, Ida's older half brother. He signed the page twice, once on August 26, 1890, and again on July 2, 1904. His mother was Sophia (Hersey) Gray, who died in 1836. His father then married Hepzibah R. (Huff), Ida's mother. Delia Huff, "your cousin". Delia's father, William B. Huff, was a brother to Ida May (Gray) Huff's mother Hepzibah R. (Huff) Dunn. C. O. Newell. He was Charles O. Newell of Maine and Boston, Massachusetts. His wife Sarah A. (VanTassel) Newell signed the right facing page. S. A. Newell of Boston, Massachusetts. She was Sarah A. (VanTassel) Newell, born in Nova Scotia, and wife of signer Charles O. Newell. Anna E. Newmarch. Anna would marry Ida May (Gray) Dunn's brother William Ellery Dunn, who also signed a page in the album. 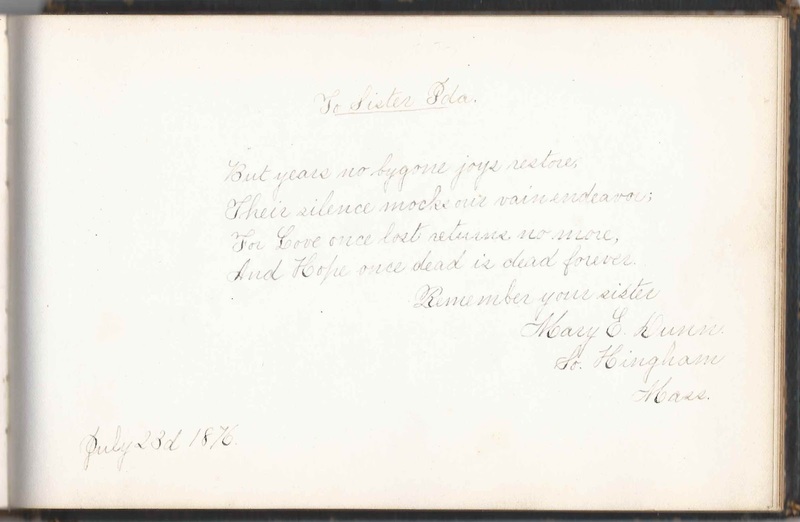 Anna E. (Newmarch) Gray signed another page on December 29, 1871. Julia E. Somes of Boston, Massachusetts, signed on June 15, 1873, a half sister to album owner Ida May (Gray) Dunn through their mother Hepzibah R. (Huff) who married four times. W. B. ?, possibly W. B. Wright, signed on September 14, 1870. "Best wishes for future happiness to Mr. & Mrs. Alexander Dunn"
Charles Ashley Gray and Hepzibah R. Huff were my 2nd great grandparents. Neat, Art! Glad you happened upon this post. Does the information mesh with what you have? Everything looks good you did a good job researching. One thing about Hepzibah Huff. Her name is sometimes given as Hepzibah R Huff but on her tombstone and her Boston Death Certificate it is Hepzibah P Huff. I have a great many family artifacts such as the Gray Family Bible lots of photos etc. Idas brother William went to sea at age 14 in 1856. I have his seaman's knife. He and his half brother Charles went to California by way of Panama in 1858 and didn't return until 1871 so they both missed out on the Civil War. My mother the granddaughter of William Gray, always referred to Ida as aunt Ida and talked about her often.